Learn about an ancient sword. While exploring the Tribulation Crypt, I encountered a ghost that beckoned me deeper into the tomb. The ghost led me to an ancient sword engraved with the following message: "Marcelle Stenric of Shornhelm. Head to the Tribulation Crypt and follow a ghostly knight. Find a Stenric descendant in Shornhelm and talk to them. The Legend of Dame Marcelle, which can be found nearby the sword, has some more information about the ghost's persona. The ghost apparently wants me to do something with the sword. I should find a member of the Stenric family in Shornhelm and give the sword to them. 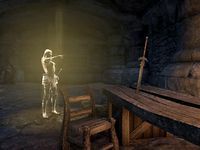 Finishes quest When I arrived in Shornhelm, the ghost appeared and directed me to Trierre, a member of the Stenric family. I should talk to him and tell him about the sword.